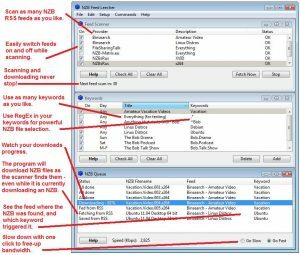 NZB Feed Leecher is a program designed to automate your NZB downloading chores. For example, suppose that right now you go to an NZB indexing site ten times per week. You search for various files, download the NZBs, load them into your downloader program, and wait impatiently while they download. Well, if your indexing site provides an RSS feed, you can avoid doing all of that work. Instead, you could have NZB Feed Leecher watch the feed around the clock, and it will automatically pull your normal NZBs out of the stream using your keywords, and then download the files. Note: NZB Feed Leecher can handle NZB files with obfuscated filenames. However, if the title is obfuscated, then your keywords won’t match. So, you want to have access to a human-curated feed where the editors de-obfuscate the titles. An example is FileSharingTalk.com. To learn more about NZB RSS feeds, see this page: What is an NZB RSS Feed? When you click the “Start” button on this window, the program will go through all of your feeds and check them for the presence of your keywords. When it is done, it will pause for 60 seconds and then do another cycle. If you are impatient, and don’t want to wait 60 seconds, you can click the “Fetch Now” button. When there is a keyword match, the matching NZB file will be added to the NZB Queue window for downloading (see below). If you want to see what is in the feed, you can look at it with the Peeker (see below). Important – In order to prevent missing any files, you will want to run NZB Feed Leecher around the clock because NZB-indexing sites can update their feeds at any time. Ready – the feed has not been checked yet. Fetching – the feed is being pulled right now. OK – the feed was fine on the last cycle. Error – some kind of network error. Empty – the server didn’t send the feed. Couldn’t save feed – maybe your disk is full. gZip error – couldn’t decompress the feed. When you get an error message, you can use the Peeker to see if there is an error message in the feed. Often, you will see something like: “the server will be back up in 15 minutes.” If you don’t see anything in the feed itself, you can go to the NZB-indexing site and ask about it in their support forum. This is where you tell NZB Feed Leecher what you want to download. After it downloads a feed, the program will scan it for any occurrence of your keywords. If there are any matches, those NZB files will be added to the NZB Queue window for downloading. Click the “Add” button to make a new keyword. Then click on that line in the list in the “Keywords” column to type in your new keyword. You can put anything you want in the “Day” and “Title” columns – they are just there to help you remember what all of your keywords do. When you are done with a keyword, click on it in the list, and then click the “Delete” button. Or to temporarily disable it, un-check its box in the “On” column. Keywords will match any occurrence in the title of the NZB file. For example, if you enter “news” you will get matches on “newsgroup”, “news server”, “news feed”, “news reader”, etc. Often, a simple keyword will generate too many false-positive matches. So, you can also use a “regular expression” or regex. See Wikipedia’s regex page for more details. If you are new to regular expressions, they look terribly complicated. However, chances are that you will only need to learn a few simple ones. Another handy regex is . * which will match to anything. You may want to use it to stress-test your system, or just download everything in sight. Some NZB-indexing sites follow formatting conventions. For example, video files are usually named like this: Some.Video.S01E08. So, if you wanted to download the “Awesome Video” series, using Awesome.Video as your keyword should get you all the episodes with few false positives. Adding a caret, as discussed above, should reduce false positives to zero. Fed from RSS – got the title. Fetching from RSS – getting the NZB file. Saved from RSS – got the NZB file. Loading – loading in the NZB file. Loaded – ready to download the files in the NZB. Decoding – only shows up during last file. PARing – processing the PAR files, if any. RARing – processing the RAR files, if any. All Done – everything went smoothly. PARing Problem – something went wrong during the PARing process. See if QuickPar can help on Windows, or MacPar Deluxe on the Mac. RARing Problem – something went wrong during the RARing process. See if WinRar can help on Windows, or MacPar Deluxe on the Mac. Incomplete – for some reason, the program was not able to get all the files from your server(s). When this happens, you might want to copy the completed files, and the part files into SuperNZB’s folders. When you then start SuperNZB, it will show which files are incomplete, and you can try to find the missing parts. SuperNZB works very well as a “debugger” in these cases because it shows exactly where the problem is. NZB Feed Leecher is designed to run unattended. So, it doesn’t give you a lot of control over the download queue. If you like to obsess over your downloads, then you definitely want to be using SuperNZB which gives you very fine-grained control. If you click in the “Status” column of an NZB file, the status will change to “Skip” and the program will not download the file. If you click again, it will change back to “Saved from RSS” and will be downloaded. If an NZB is in the “Downloading” phase, clicking on it will stop it. When it is marked as “Stopped” you can click it again to resume it. If you double-click on an NZB file in the list, its download folder will open up. If the size is zero, click on it and NFL will calculate it. If you switch to “Go Slow” mode, the program will download with only one server connection. You should use this feature while you are working on the computer/network and don’t want NZB Feed Leecher hogging all the bandwidth. In “Go Fast” mode, the program will use all of the servers and connections that you have set-up on the Servers window. Typically, people will use “Go Fast” mode overnight, or when they are not at home. The “Feed” and “Keyword” columns are so that you can see why the NZB was selected for downloading. 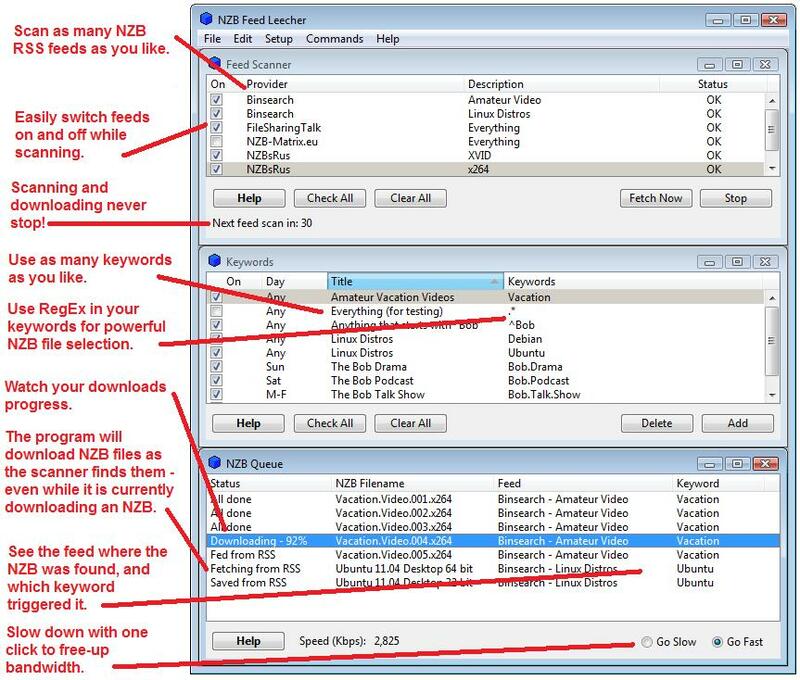 If you have several feeds, and are getting bad NZB files, this will help figure out which feed they are coming from. If you are getting false-positive matches, you will be able to see which keyword is triggering them. This window lets you look at the raw text of a feed. This is helpful when your NZB-indexing site is having technical difficulties because sometimes they will put a message in the feed. Another reason to look at the feed is when you have just added it to the software and you want to test it by downloading something. So, you could look at the feed, pick out an NZB file, add a keyword that will match it, and start the feed scanner. Some feeds also have HTML formatting. So the Peeker allows you to switch back and forth between the raw text and the formatted text. If there are links in the formatted text, you can click them just like in a web browser. Once you click a link, the “Back” button will become visible. You can look at an NZB RSS feed with any RSS reader program. However, if the program is slow to update its feeds, what you see there might be old data. By contrast, the Peeker will always show you what the server is actually sending out in real time. The Peeker doesn’t update automatically as the feed scanner cycles. So, click the “Refresh” button to see the current contents of the feed. Different NZB-indexing sites update their feeds at different intervals. So, it is not unusual for a feed to remain unchanged for long periods of time. NZB Feed Leecher will try to avoid downloading the same NZB file twice. It does so by keeping a list of the files it has already downloaded. You can see the list by going onto the “File” menu and then to “Open Completed NZB Files.” This mechanism will only work when files are named consistently. For example, suppose that the program downloads ten files, and then you reboot your system, and re-start the app using a different feed that uses a different file-naming convention. In that case, some of the files may be re-downloaded. The format will vary a lot from site-to-site. Also, make sure to see if the feed is compressed. If it is, check the “Zipped” box. Most sites do not compress their feeds. Once you have the feed entered, you can click the “Test Feed” button to see if it works. The “View Feed” window will open, and if you get a status code of 200, then the feed is okay. If you get an error code, you can look at the raw feed, and the feed headers, for a clue as to what the problem is. To set-up a server, go onto the “Setup” menu, then to “Servers” and the “Setup Servers” window will open. Click the “Make New Server” button, enter the info, and click the “Save” button. The “Name” can be anything you like. The URL, user name, and password must be exactly as instructed by your service provider. Enter the number of “Connections” that you want to use. Check with your service provider to see how many they allow. Past a certain point, more is not better. Using 15 connections probably won’t make your downloading much faster than using 10. Check the “Active” box to tell the program to use the server. Un-check the box if you don’t want to use it for some reason, such as it is over its monthly data limit. Please see our Usenet Port & SSL Settings page for a discussion of those settings. If you have more than one server, the NZB Queue window will load them in alphabetical order. So, if you switch to “Go Slow” mode, the server used will be the first one. Right now, there is no way to directly tell NZB Feed Leecher which server to use. However, you can modify its name so that it is first in alphabetical order. The “Name” and “Description” can be anything you like. The “Extension” should be entered without the dot. For example, enter “mp3” and not “.mp3”. Another way to see if you need to add extensions is to open the “debug” file and search it for “Can’t find filename in.” To find the debug file, go onto the “Help” menu, and then to “Open App Data” folder. On the Mac, this will be the same folder where the program is. The file is named “NZB-Feed-Leecher-Debug.txt” and is a plain text file. To test the connection to your Usenet newsgroup server, go onto the “Help” menu and then to “Test News Server” and the Test Server window will open. This is the same tool as in SuperNZB, so please see this page for further instructions.